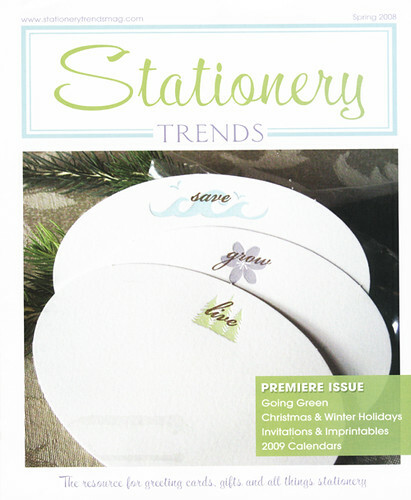 Yesterday I received something totally exciting and inspiring in my mailbox - the premiere issue of Stationery Trends magazine! I knew from the cover that this was going to be an awesome publication and the content did not disappoint. If you work in the industry or are a stationery aficionado, you have to check out this magazine! It's a fresh and wonderful take on the industry and its close ties to trends sweeping all areas of design. The first issue started off with an issue very close to my heart - eco-awareness. I loved the section on Pop-Art, especially these adorable Boatman Geller pieces. I don't want to ruin all of their great trend features but they were spot on and will definitely be inspiring future Tuesday Trend posts! They have a ton of great articles including designer profiles, National Stationery Show coverage, Designer Inspirations and more! There is just so much information, inspiration and style packed into every issue. As Grace over at Design*Sponge pointed out, numbers and letters on objects are a mini-trend of the moment which means that many people are opting for simple monograms over full personalization on their stationery. Shown here are two popular items from our stationers The Paper Menu (monogrammed wall art frame) and Crane & Co. (initial monogram stationery). The website for Stationery Trends is still under construction, but you can visit it right here for more information on editorial submissions, subscriptions and advertising. I will be checking back frequently to see what's new on the site (and to hold me over until the next issue is released). 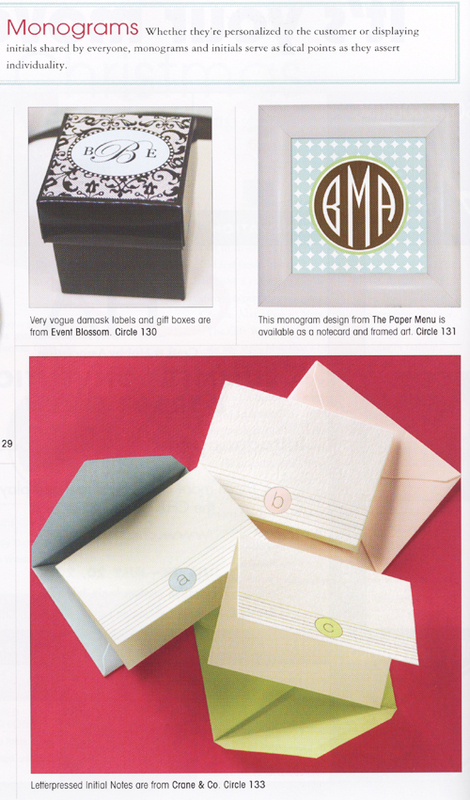 A special thank you to Sarah at Stationery Trends who so graciously allowed me to share scans of the publication with all of you. I knew many of you would love it - we've all been fighting over our solo copy at the office!